Last Thursday morning my New Jersey home was the site of a rendezvous with fellow pulp aficionados Nick Certo, Scott Hartshorn, Digges La Touche, and Walker Martin. They arrived shortly before 9 a.m. for our annual trip to PulpFest. We’ve been traveling together for many years now (the same motley crew accompanies me on our trip to the Windy City pulp convention every April), always riding in a rented 15-seat van we’ve affectionately dubbed the Great White Whale. There might only be five of us, but we need a vehicle that big to hold our dealer stock and convention purchases, so the rental agency removes the last two rows of seats for us. We loaded up in double time and made a quick stop for coffee at my local Dunkin Donuts, as per our usual custom. By 9:30 we were zooming westward on Route 80, once more bound for the Double Tree Hilton Pittsburgh—Cranberry, which despite its name is actually located in Mars, Pennsylvania. Last year’s PulpFest was the first staged in this excellent venue, and we all looked forward to returning. Arriving just before 5 p.m., we unloaded luggage and stock and made a beeline for the 13,500-square-foot ballroom that doubles as the con’s exhibit space. I dumped my boxes on the table assigned to me but didn’t bother setting up, preferring to canvas the room for bargains. Long-time collector Walter Albert scans the dealer room. Almost immediately I spotted an eye-popping display of high-grade, dust-jacketed editions of Chelsea House books reprinting stories from early Street & Smith pulps. Dozens and dozens of them. For more than 15 years I’d been seeking a copy of Cherry Wilson’s Stormy, originally serialized in Western Story Magazine. And there it was, right in front of me! I snatched up the book only to be informed by dealer Scott Edwards that fellow dealer and uber-collector Rich Meli had just that second purchased the entire lot. I was crushed. But at a table just down the aisle from Scott’s exhibit, my long-time friend Sheila Vanderbeek had just laid out another batch of Chelsea House first editions. Lo and behold, she too had a copy of Stormy! It lacked the wrapper and wasn’t quite as sharp as Scott’s, but I grabbed it nonetheless. My long search was over. O frabjous day! I joined a bunch of friends and fellow attendees for dinner, which took longer than anticipated and caused us to miss the show’s first programmed event. 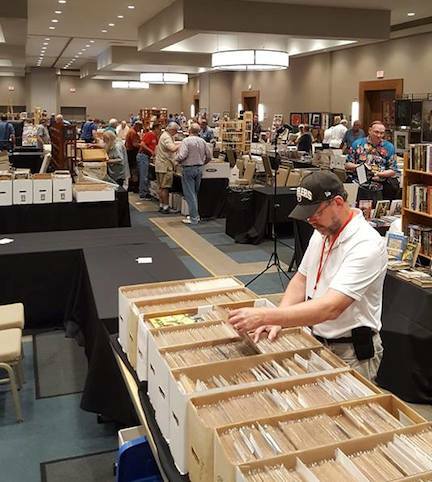 This year’s PulpFest celebrated the 100th anniversary of World War I’s conclusion, with the Philip José Farmer centennial a sub-theme being explored at Farmercon, PulpFest’s satellite gathering. Sai Shankar, whose Pulp Flakes blog is a treasure, discussed the life and output of Leonard Nason, a treasured contributor to Adventure who specialized in stories about the Great War. Sai’s presentation was followed by one from Burroughs Bulletin editor Henry Franke covering the War’s impact on ERB’s work. Michelle Nolan brought up the rear with an exploration of war comics. Fairly exhausted from my preparations for the trip and the long drive I retired early and was sound asleep by midnight. But I woke up at about 1:30 and couldn’t get back to sleep. Friday’s session opened promisingly as bargain seekers hurried from table to table, but within a few hours the pace slowed and it occurred to me attendance might be down somewhat. (Later on, PulpFest chairman Jack Cullers confirmed that to me.) 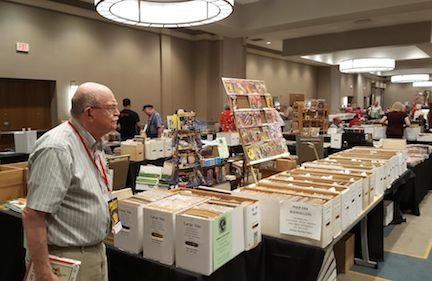 Quite unintentionally, pulp-convention huckster rooms often have their own theme—being dominated one year by hero pulps, the next by detective pulps, and so on—and this time around PulpFest was surfeited with Westerns. The two auctions, being made up primarily of material from three estates, fairly teemed with them. I had quite a few in my 20-percent-off Bargain Box. And even dealers who normally don’t stock the things, like Connecticut’s Paul Herman, were offering them in large quantities. Dennis Harford making a box-by-box search for treasure. Afternoon programming mostly featured readings from New Pulp authors, per usual. I heard good things about Christopher Paul Carey’s recitation from Swords Against the Moon Men, his authorized sequel to Edgar Rice Burroughs’ The Moon Maid. (Artist Mark Wheatley was also on hand to display his gorgeous illustrations for the book.) Chris and Mark, joined by Mike Croteau and PulpFest Special Guest Joe Lansdale, discussed the influence and legacy of Philip José Farmer in one of the prime-time sessions. That was followed by a presentation by Bob Deis and Wyatt Doyle on war-themed material in men’s “sweat” magazines. 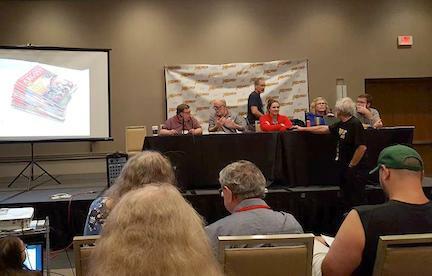 Next was a panel on air-war pulps featuring pulp historian Don Hutchison, PulpFest’s own Mike Chomko, and Age of Aces principals Bill Mann and Chris Kalb. After that Bob Gould, son of prolific Popular Publications illustrator John Fleming Gould, entertained con attendees with an account of his dad’s career. Auctioneers Joe Saines (left) and John Gunnison. The Friday-night auction featured a variety of items but was dominated by heavy bidding on nearly innumerable 12-issue lots of Street & Smith’s long-running Wild West Weekly. I didn’t compete for most of them—wouldn’t bid against good friends who had already expressed interest—but managed to win a dozen from 1936 and a dozen from 1943, the magazine’s last year. One lot set me back $50, the other $45, for a per-issue cost of four dollars. Not bad. Regular PulpFest auctioneers John Gunnison and Joe Saines did their usual top-notch job keeping things moving and disposing of more than 200 lots in record time. Even so, it was past 1 a.m. when they brought the gavel down on the last, and having gotten less than two hours of sleep the previous night I staggered back to my room for what I hoped would be deep, lengthy slumber. Terrific report Ed. I am looking forward to reading part two. I always love reading reports on the pulp conventions. Here it is three days later and I still haven’t recovered. Sleep deprived, back hurting, limping, but wondering how fast the time went. I wrote my report Tuesday after the convention but don’t know when it will be published since Steve has bought a house on the west coast and is pretty busy. Good report! It was my first PulpFest. I thought it was great and enjoyed talking with you and other pulp mavens. Mike Chomko and the rest of the PulpFest team did an excellent job of organizing and promoting the event. I hope to be there next year. A great report – I’m impressed by your stamina after the long drive from New Jersey. And after the convention, you had to drive back. Thanks for the kind words about my blog. I am back home after lugging two suitcases totaling over 110 pounds and still recovering from the physical stress. All worth it though, because of an excellent convention. As you say, the auction was a highlight – I managed to snag a few issues of Dime Western at a reasonable price. The organizing committee did an excellent job, and i wish them good luck with finding the support they need to keep this event going.